Many people consider Paintless Dent Repair/Removal (PDR) as a “new fad”, but it has been practised and refined since the early 1960s. This means that millions of cars have received this treatment with great results and you can rest assured that the methods we employ are the best in the industry. But what exactly is PDR and how does it work? Traditionally, a damaged body part (irrespective of the severity of damage) had to be removed, panel beaten, filled with body filler, sanded, given a base coat, baked, then given several layers of top coat, baked again, and fitted back onto the vehicle. The older the vehicle the more onerous it was to match the paint to the old colour. A newer car didn’t guarantee a flawless result either. The number of new models from different parts in Asia meant that panel beaters had to keep abreast of every paint specification, so the more up-to-date the panel beater, the more expensive his service. PDR was invented in 1960 by a Mercedes employee, Oskar Flaig, who had to ensure the flawlessness of cars in his care at one of the biggest shows in the USA, the International Motor Sports Show which was held in New York City. Oskar managed to work his magic with rudimentary tools but over the last 50+ years the methods and tools have improved to what we have today. 2. The “massage” method which requires the technician to remove interior items such as carpeting and plastic panels which protect the wiring and insulates the vehicle. Then only can he access the damaged area to repair it properly. However, if the damaged area is still inaccessible, he has to remove the panel to repair it. The success of either one of these methods relies on the extent of the damage. If the dent is smooth, without rough or sharp edges and which is also not creased or punctured, then PDR will work its magic. See our blog on The Advantages of Paintless Dent Repair vs. Conventional Dent Repair for a more detailed discussion on which method is more suitable for your particular needs. AT PDRNY, we use both methods to ensure that your vehicle’s damage is repaired in the most cost-effective way possible. Depending on the extent and type of damage, we guarantee that we can restore your car to its original condition without the cost of traditional repairs. Either method carries our industry standard warranty and are accepted by insurance companies. Our certified technicians will be able to give you an exact quote for the repair of that unsightly dent, which, if left unattended, will decrease the value of your car considerably. Read our blog Repairing Your Dent After a Hail Storm for more detail on what can happen if you don’t repair a dent. Hail damage must be one of the most frequent insurance claims, not only in America, but across the world. Storms are increasing in intensity and regardless of the reasons for this; we would still like to keep one of our most prized possessions as pristine as the day we bought it. Living in the east coast makes automotive hail damage an inevitable event in the life of a vehicle owner. We are here to help through the process of repairing hail damaged vehicle across Bronx, Yonkers, Manhattan, Westchester and New York areas. If you are one of the unlucky ones who were caught in a hail storm, you need to call your insurance agent to assess the damage. 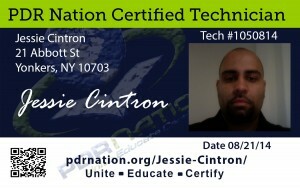 If you’re looking for a reputable and certified PDR technician, look no further. PDRNY are industry certified and approved by all insurance companies for quality repair work to hail damaged vehicles. Our methods are tried, tested and guaranteed to restore your damaged car to its former glory. Our highly qualified technicians will give you an accurate quotation for the repairs. Let us partner with you in restoring your vehicle. Our process of paintless dent repair delivers the highest quality repair available having served Bronx, Yonkers, Manhattan, Westchester and New York areas for many years. Hail is unexpected, but we make it look brand new all over again. When it comes to Hail storm damage we got you covered. We expand on the technicalities behind hail damage to your vehicle. In short, dependent on the severity and size of the hail stones, your vehicle may just be superficially damaged. Having industry certified technicians with many years of experience has put us at the leading edge of PDR and we are able to repair the damage to your vehicle in the most professional way possible. For those unexpected hail storms, let us restore your vehicle. Schedule your hail estimate today and we will walk with you through the entire process of restoring your vehicle to its pre-damage condition. Call today: (914) 403-6359. Serving Bronx, Yonkers, Manhattan, Westchester and New York areas. Which method do we employ? For light to medium hail damage, we use the glue suction method. The process involves sucking the dent out so that it flattens and matches the surrounding area. For this we use two types of tools, the one is pulled by hand and is used for fairly inaccessible places as it’s narrower and easier to use in confined spaces. For flatter and easier to access panels, a kind of tripod is used where the technician gently squeezes a ratchet to pull the dent back into shape. Deciding on where to start with the repairs greatly depends on the repair technician’s experience. Starting in the wrong place or with the wrong area, can do more damage by weakening the structure of the body panel, causing warping and waving of a panel, or even crack the paint. Appointing a “hail chaser” without the proper credentials and backup warranty will see your prized possession damaged even more, without him taking responsibility for the damage. It also means that your insurance company may not pay out for the subsequent damage. We are industry certified and approved by all insurance companies for quality repair work to hail damaged vehicles. Our methods are tried, tested and guaranteed to restore your damaged car to its former glory. Our highly qualified technicians will give you an accurate quotation for the repairs. One of the main differences between a luxury car or restored classic and all the other models, is their enhanced structural components. Skilled and highly experienced technicians, such as the ones here at PDRNY, are able to assess the damage to your vehicle and from the severity of the damage, are able to quickly determine the best method to employ to restore your vehicle to pristine condition. Not all dents are easily accessible, especially with the structural differences in luxury and classic cars. In some cases panels have to be removed to enable the technician to gain easy access to repair that unsightly dent. Paint specifications for luxury and customized vehicles are also different from standard specifications. The higher-end paint finishes include metallic, pearlescent and “flip” colors. These paints consist of minuscule metallic flakes which give the paint finish its unique look. Depending on the light, the color could either sparkle (metallic), subtly change color (pearlescent) and even change color entirely (flip). Metal flake paint is even more specialized, being reserved for hot-rods and other modified cars, and for promotion vehicles. In the past, these paints could only be mixed and applied by artisans in their field and luxury car manufacturers would charge a premium for this paint option. Some vehicles (notably motorcycles) may even have candy apple paint finishes. All these paint finishes give vehicles their characteristic luxury- or once-off look, but it has one major drawback – it highlights the smallest imperfection in the bodywork of the particular vehicle. In addition, any repair to the vehicle would be difficult because matching the colour and finish can be near impossible. Previously, the only method used to repair even minor scratches to a vehicle, was to remove the panel and subject it to many hours of painstaking restoration with the hope that the end result would not be evident. Our methods and results ensure that no trace of the repair remains and our techniques guarantee that your vehicle will be restored to its original condition without resorting to body fillers and repainting. With Paint less Dent Repair (PDR), you no longer have to worry about old-fashioned methods which are costly, time consuming and often below standard. We are industry certified to use the best method of PDR to guarantee your vehicle doesn’t lose any of its resale value.